Prince Harry had his face smeared with red paint today as he celebrated Holi, the Hindu festival of colour, alongside Nepalese school children. The Royal had his ginger beard and forehead turned a deeper shade of red as he joined in with the playful mayhem during his five-day tour of the country. Harry was at the Gauda Secondary School in the village of Okhari, 4,500ft up in the Himalayan mountains. There he saw how the British-based Gurkha Welfare Trust is helping to fund the rebuilding of the school after a number of buildings were damaged during last year's earthquake. Before the paint fight began, he was shown around the school, where brick-built classrooms will replace the temporary tin huts in which children are being taught. 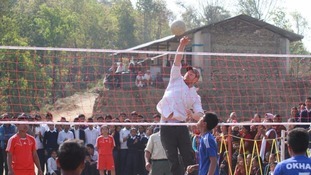 The 31-year-old also got stuck in to a game of volleyball with pupils, using his 6ft 2in height to all its advantage. He spent an hour trekking down a hill to reach the school, having stayed the night at the home of an 86-year-old widow of a former Gurkha rifleman. Harry described the experience as "amazing". It was amazing really, peaceful actually. Lots of dogs barking, but it didn't seem to bother them. Apparently the locals, they're happy if the dogs are barking, but they're not happy if they dogs are not barking. The family were fantastic, we had a proper feast of a meal and then they vanished, that was it, never saw them again. We all went to be early so we were tucked up by half past eight, then everything started to come to life at quarter past, half past five.